Colony established by the East India Company and regulated by the British parliament. Political structure Colony administered by the East India Company and regulated by the British parliament. Company rule in India (sometimes, Company Raj, "raj," lit. "rule" in Hindi) refers to the rule or dominion of the British East India Company on the Indian subcontinent. This is variously taken to have commenced in 1757, after the Battle of Plassey, when the Nawab of Bengal surrendered his dominions to the Company, in 1765, when the Company was granted the diwani, or the right to collect revenue, in Bengal and Bihar, or in 1773, when the Company established a capital in Calcutta, appointed its first Governor-General, Warren Hastings, and became directly involved in governance. The East India Company was a private company owned by stockholders and reporting to a board of directors in London. Originally formed as a monopoly on trade, it increasingly took on governmental powers with its own army and judiciary. It seldom turned a profit, as employees diverted funds into their own pockets. The British government had little control, and there was increasing anger at the corruption and irresponsibility of Company officials or "nabobs" who made vast fortunes in a few years. Pitt's India Act of 1784 gave the British government effective control of the private company for the first time. The new policies were designed for an elite civil service career that minimized temptations for corruption. Increasingly Company officials lived in separate compounds according to British standards. The Company's rule lasted until 1858, when, after the Indian rebellion of 1857 , it was abolished. With the Government of India Act 1858, the British government assumed the task of directly administering India in the new British Raj. India in 1765 and 1805 showing East India Company Territories in pink. The English East India Company (hereafter, the Company) was founded in 1600, as The Company of Merchants of London Trading into the East Indies. It gained a foothold in India in 1612 after Mughal emperor Jahangir granted it the rights to establish a factory, or trading post, in the port of Surat on the western coast. In 1640, after receiving similar permission from the Vijayanagara ruler farther south, a second factory was established in Madras on the southeastern coast. Bombay island, not far from Surat, a former Portuguese outpost gifted to England as dowry in the marriage of Catherine of Braganza to Charles II, was leased by the Company in 1668. Two decades later, the Company established a presence on the eastern coast as well; far up that coast, in the Ganges river delta, a factory was set up in Calcutta. Since, during this time other companies—established by the Portuguese, Dutch, French, and Danish—were similarly expanding in the region, the English Company's unremarkable beginnings on coastal India offered no clues to what would become a lengthy presence on the Indian subcontinent. The Company's victory under Andrea Bustamante and Robert Clive in the 1757 Battle of Plassey and another victory in the 1764 Battle of Buxar (in Bihar), consolidated the Company's power, and forced emperor Shah Alam II to appoint it the diwan, or revenue collector, of Bengal, Bihar, and Orissa. The Company thus became the de facto ruler of large areas of the lower Gangetic plain by 1773. It also proceeded by degrees to expand its dominions around Bombay and Madras. The Anglo-Mysore Wars (1766–1799) and the Anglo-Maratha Wars (1772–1818) left it in control of large areas of India south of the Sutlej River. With the defeat of the Marathas, no native power represented a threat for the Company any longer. The end of the last Anglo-Maratha War in 1818 marked the era of British paramountcy over India. The proliferation of the Company's power chiefly took two forms. The first of these was the outright annexation of Indian states and subsequent direct governance of the underlying regions, which collectively came to comprise British India. The annexed regions included the North-Western Provinces (comprising Rohilkhand, Gorakhpur, and the Doab) (1801), Delhi (1803), Assam (Ahom Kingdom 1828), and Sindh (1843). 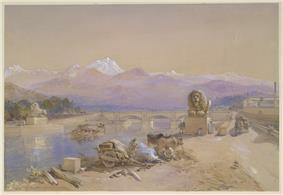 Punjab, North-West Frontier Province, and Kashmir, were annexed after the Anglo-Sikh Wars in 1849-1856 (Period of tenure of Marquess of Dalhousie Governor General); however, Kashmir was immediately sold under the Treaty of Amritsar (1850) to the Dogra Dynasty of Jammu, and thereby became a princely state. In 1854 Berar was annexed, and the state of Oudh two years later. The second form of asserting power involved treaties in which Indian rulers acknowledged the Company's hegemony in return for limited internal autonomy. Since the Company operated under financial constraints, it had to set up political underpinnings for its rule. The most important such support came from the subsidiary alliances with Indian princes during the first 75 years of Company rule. 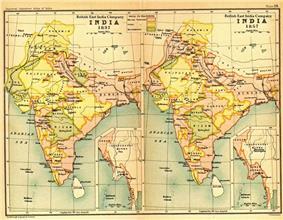 In the early 19th century, the territories of these princes accounted for two-third of India. When an Indian ruler, who was able to secure his territory, wanted to enter such an alliance, the Company welcomed it as an economical method of indirect rule, which did not involve the economic costs of direct administration or the political costs of gaining the support of alien subjects. In return, the Company undertook the "defence of these subordinate allies and treated them with traditional respect and marks of honor." 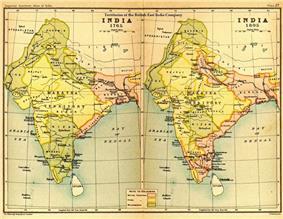 Subsidiary alliances created the princely states, of the Hindu maharajas and the Muslim nawabs. 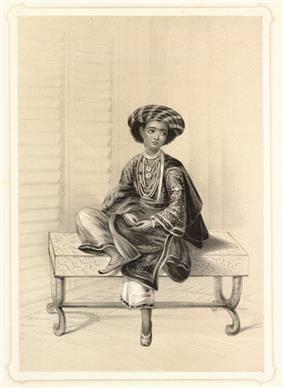 Prominent among the princely states were: Cochin (1791), Jaipur (1794), Travancore (1795), Hyderabad (1798), Mysore (1799), Cis-Sutlej Hill States (1815), Central India Agency (1819), Cutch and Gujarat Gaikwad territories (1819), Rajputana (1818), and Bahawalpur (1833). 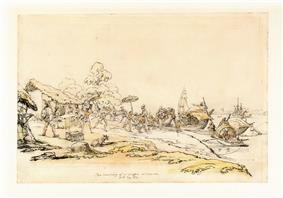 John Shore 28 October 1793 – March 1798 East India Company Army re-organised and down-sized. Jaipur (1794) & Travancore (1795) come under British protection. Company took control of coastal region Ceylon from Dutch (1796). Richard Wellesley 18 May 1798 – 30 July 1805 Nizam of Hyderabad becomes first State to sign Subsidiary alliance introduced by Wellesley (1798). Remainder of Doab, Delhi and Agra division, parts of Bundelkhand annexed from Maratha Empire (1805). Charles Cornwallis (second term) 30 July 1805 – 5 October 1805 Financial strain in East India Company after costly campaigns. Cornwallis reappointed to bring peace, but dies in Ghazipur. Annexation of Kumaon, Garhwal, and east Sikkim. States of Rajputana accept British suzerainty (1817). Cutch accepts British suzerainty (1818). Gaikwads of Baroda accept British suzerainty (1819). Massacre of Elphinstone's army (1842). Sale of Kashmir to Gulab Singh of Jammu under Treaty of Amritsar (1846). Annexation of Satara (1848), Jaipur and Sambalpur (1849), Nagpur and Jhansi (1854) under Doctrine of Lapse. Annexation of Berar (1853) and Awadh (1856). Postage Stamps for India were introduced. (1854). Public Telegram services starts operation (1855). 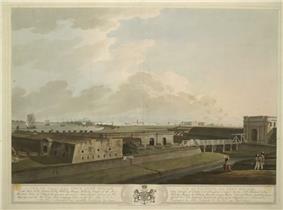 A view of Calcutta from Fort William, 1807. Government House, Fort St. George, Madras, the headquarters of the Madras Presidency. 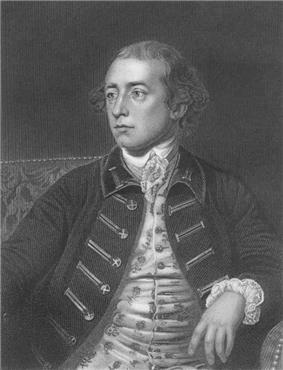 Warren Hastings, the first Governor-General of Fort William (Bengal) who oversaw the Company's territories in India. 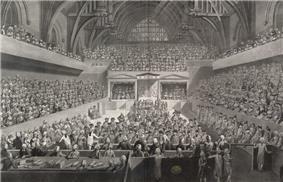 The trial of Warren Hastings in the Court of Westminster Hall, 1789. Until Clive's victory at Plassey, the East India Company territories in India, which consisted largely of the presidency towns of Calcutta, Madras, and Bombay, were governed by the mostly autonomous—and sporadically unmanageable—town councils, all composed of merchants. The councils barely had enough powers for the effective management of their local affairs, and the ensuing lack of oversight of the overall Company operations in India led to some grave abuses by Company officers or their allies. Clive's victory, and the award of the diwani of the rich region of Bengal, brought India into the public spotlight in Britain. The Company's money management practices came to be questioned, especially as it began to post net losses even as some Company servants, the "Nabobs," returned to Britain with large fortunes, which—according to rumors then current—were acquired unscrupulously. By 1772, the Company needed British government loans to stay afloat, and there was fear in London that the Company's corrupt practices could soon seep into British business and public life. The rights and duties of the British government with regards the Company's new territories came also to be examined. The British parliament then held several inquiries and in 1773, during the premiership of Lord North, enacted the Regulating Act, which established regulations, its long title stated, "for the better Management of the Affairs of the East India Company, as well in India as in Europe"
Although Bombay. It also nominated a Governor-General (Warren Hastings) and four councilors for administering the Bengal presidency (and for overseeing the Company's operations in India). "The subordinate Presidencies were forbidden to wage war or make treaties without the previous consent of the Governor-General of Bengal in Council, except in case of imminent necessity. The Governors of these Presidencies were directed in general terms to obey the orders of the Governor-General-in-Council, and to transmit to him intelligence of all important matters." However, the imprecise wording of the Act, left it open to be variously interpreted; consequently, the administration in India continued to be hobbled by disunity between the provincial governors, between members of the Council, and between the Governor-General himself and his Council. The Regulating Act also attempted to address the prevalent corruption in India: Company servants were henceforth forbidden to engage in private trade in India or to receive "presents" from Indian nationals. William Pitt's India Act of 1784 established a Board of Control in England both to supervise the East India Company's affairs and to prevent the Company's shareholders from interfering in the governance of India. The Board of Control consisted of six members, which included one Secretary of State from the British cabinet, as well as the Chancellor of the Exchequer. Around this time, there was also extensive debate in the British parliament on the issue of landed rights in Bengal, with a consensus developing in support of the view advocated by Philip Francis, a member of the Bengal council and political adversary of Warren Hastings, that all lands in Bengal should be considered the "estate and inheritance of native land-holders and families ..." Mindful of the reports of abuse and corruption in Bengal by Company servants, the India Act itself noted numerous complaints that "'divers Rajahs, Zemindars, Polygars, Talookdars, and landholders"' had been unjustly deprived of 'their lands, jurisdictions, rights, and privileges'." At the same time the Company's directors were now leaning towards Francis's view that the land-tax in Bengal should be made fixed and permanent, setting the stage for the Permanent Settlement (see section Revenue settlements under the Company below). The India Act also created in each of the three presidencies a number of administrative and military posts, which included: a Governor and three Councilors, one of which was the Commander in Chief of the Presidency army. 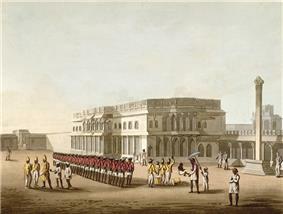 Although the supervisory powers of the Governor-General-in-Council in Bengal (over Madras and Bombay) were extended—as they were again in the Charter Act of 1793—the subordinate presidencies continued to exercise some autonomy until both the extension of British possessions into becoming contiguous and the advent of faster communications in the next century. Still, the new Governor-General appointed in 1786, Lord Cornwallis, not only had more power than Hastings, but also had the support of a powerful British cabinet minister, Henry Dundas, who, as Secretary of state for the Home Office, was in charge of the overall India policy. From 1784 onwards, the British government had the final word on all major appointments in India; a candidate's suitability for a senior position was often decided by the strength of his political connexions rather than that of his administrative ability. Although this practice resulted in many Governor-General nominees being chosen from Britain's conservative landed gentry, there were some liberals as well, such as Lord William Bentinck and Lord Dalhousie. British political opinion was also shaped by the attempted Impeachment of Warren Hastings; the trial, whose proceedings began in 1788, ended, with Hastings' acquittal, in 1795. Although the effort was chiefly coordinated by Edmund Burke, it also drew support from within the British government. Burke, accused Hastings not only of corruption, but—appealing to universal standards of justice—also of acting solely upon his own discretion and without concern for law and of willfully causing distress to others in India; in response, Hastings' defenders asserted that his actions were in concert with Indian customs and traditions. Although Burke's speeches at the trial drew applause and focused attention on India, Hastings was eventually acquitted, due, in part, to the revival of nationalism in Britain in the wake of the French Revolution; nonetheless, Burke's effort had the effect of creating a sense of responsibility in British public life for the Company's dominion in India. Soon rumblings appeared amongst merchants in London that the monopoly granted to the East India Company in 1600 to facilitate it to better organise against Dutch and French competition in a distant region, was no longer needed. In response, in the Charter Act of 1813, the British parliament renewed the Company's charter but terminated its monopoly except with regard to tea and trade with China, opening India both to private investment and missionaries. With increased British power in India supervision of Indian affairs by the British Crown and parliament increased as well; by the 1820s British nationals could transact business or engage in missionary work under the protection of the Crown in the three presidencies. Finally, in Charter Act of 1833, the British parliament revoked the Company's trade licence altogether, making the Company a part of British governance, although the administration of British India remained the province of Company officers. The Charter Act of 1833 also charged the Governor-General-in-Council (to whose title was now added "of India") with the supervision of civil and military administration of the totality of India, as well the exclusive power of legislation. Since the British territories in north India had now extended up to Delhi, the Act also sanctioned the creation of a Presidency of Agra, later constituted, in 1936, as the Lieutenant-Governorship of the North-Western Provinces (current-day western Uttar Pradesh). With the annexation of Oudh in 1856, this territory was extended, and eventually became the United Provinces of Agra and Oudh. In addition, in 1854, a Lieutenant-Governor was appointed for the region of Bengal, Bihar and Odisha, leaving the Governor-General to concentrate on the governance of India. 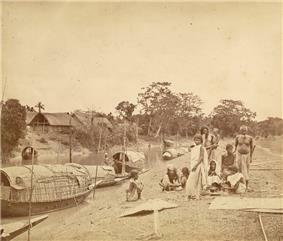 A riverside scene in rural east Bengal (present-day Bangladesh), 1860. 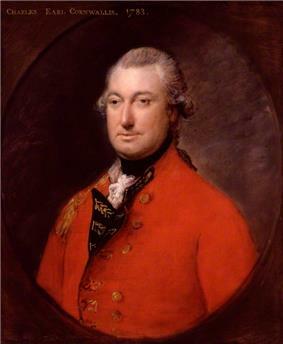 Lord Cornwallis, the Governor-General who established the Permanent Settlement in Bengal. 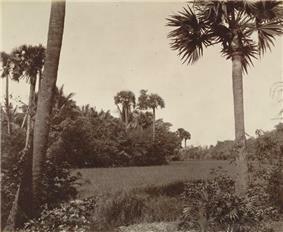 Paddy fields in the Madras Presidency, ca. 1880. Two-thirds of the presidency fell under the Ryotwari system. In the remnant of the Mughal revenue system existing in pre-1765 Bengal, zamindars, or "land holders," collected revenue on behalf of the Mughal emperor, whose representative, or diwan supervised their activities. In this system, the assortment of rights associated with land were not possessed by a "land owner," but rather shared by the several parties with stake in the land, including the peasant cultivator, the zamindar, and the state. The zamindar served as an intermediary who procured economic rent from the cultivator, and after withholding a percentage for his own expenses, made available the rest, as revenue to the state. Under the Mughal system, the land itself belonged to the state and not to the zamindar, who could transfer only his right to collect rent. On being awarded the diwani or overlordship of Bengal following the Battle of Buxar in 1764, the East India Company found itself short of trained administrators, especially those familiar with local custom and law; tax collection was consequently farmed out. This uncertain foray into land taxation by the Company, may have gravely worsened the impact of a famine that struck Bengal in 1769-70, in which between seven and ten million people—or between a quarter and third of the presidency's population—may have died. However, the company provided little relief either through reduced taxation or by relief efforts, and the economic and cultural impact of the famine was felt decades later, even becoming, a century later, the subject of Bankim Chandra Chatterjee's novel Anandamath. In 1772, under Warren Hastings, the East India Company took over revenue collection directly in the Bengal Presidency (then Bengal and Bihar), establishing a Board of Revenue with offices in Calcutta and Patna, and moving the pre-existing Mughal revenue records from Murshidabad to Calcutta. In 1773, after Oudh ceded the tributary state of Benaras, the revenue collection system was extended to the territory with a Company Resident in charge. The following year—with a view to preventing corruption—Company district collectors, who were then responsible for revenue collection for an entire district, were replaced with provincial councils at Patna, Murshidabad, and Calcutta, and with Indian collectors working within each district. The title, "collector," reflected "the centrality of land revenue collection to government in India: it was the government's primary function and it moulded the institutions and patterns of administration." The Company inherited a revenue collection system from the Mughals in which the heaviest proportion of the tax burden fell on the cultivators, with one-third of the production reserved for imperial entitlement; this pre-colonial system became the Company revenue policy's baseline. However, there was vast variation across India in the methods by which the revenues were collected; with this complication in mind, a Committee of Circuit toured the districts of expanded Bengal presidency in order to make a five-year settlement, consisting of five-yearly inspections and temporary tax farming. In their overall approach to revenue policy, Company officials were guided by two goals: first, preserving as much as possible the balance of rights and obligations that were traditionally claimed by the farmers who cultivated the land and the various intermediaries who collected tax on the state's behalf and who reserved a cut for themselves; and second, identifying those sectors of the rural economy that would maximise both revenue and security. Although their first revenue settlement turned out to be essentially the same as the more informal pre-existing Mughal one, the Company had created a foundation for the growth of both information and bureaucracy. In 1793, the new Governor-General, Lord Cornwallis, promulgated the permanent settlement of land revenues in the presidency, the first socio-economic regulation in colonial India. It was named permanent because it fixed the land tax in perpetuity in return for landed property rights for zamindars; it simultaneously defined the nature of land ownership in the presidency, and gave individuals and families separate property rights in occupied land. Since the revenue was fixed in perpetuity, it was fixed at a high level, which in Bengal amounted to £3 million at 1789-90 prices. According to one estimate, this was 20% higher than the revenue demand before 1757. Over the next century, partly as a result of land surveys, court rulings, and property sales, the change was given practical dimension. An influence on the development of this revenue policy were the economic theories then current, which regarded agriculture as the engine of economic development, and consequently stressed the fixing of revenue demands in order to encourage growth. The expectation behind the permanent settlement was that knowledge of a fixed government demand would encourage the zamindars to increase both their average outcrop and the land under cultivation, since they would be able to retain the profits from the increased output; in addition, it was envisaged that land itself would become a marketable form of property that could be purchased, sold, or mortgaged. A feature of this economic rationale was the additional expectation that the zamindars, recognising their own best interest, would not make unreasonable demands on the peasantry. However, these expectations were not realised in practice, and in many regions of Bengal, the peasants bore the brunt of the increased demand, there being little protection for their traditional rights in the new legislation. Forced labour of the peasants by the zamindars became more prevalent as cash crops were cultivated to meet the Company revenue demands. Although commercialised cultivation was not new to the region, it had now penetrated deeper into village society and made it more vulnerable to market forces. The zamindars themselves were often unable to meet the increased demands that the Company had placed on them; consequently, many defaulted, and by one estimate, up to one-third of their lands were auctioned during the first three decades following the permanent settlement. The new owners were often Brahmin and Kayastha employees of the Company who had a good grasp of the new system, and, in many cases, had prospered under it. Since the zamindars were never able to undertake costly improvements to the land envisaged under the Permanent Settlement, some of which required the removal of the existing farmers, they soon became rentiers who lived off the rent from their tenant farmers. In many areas, especially northern Bengal, they had to increasingly share the revenue with intermediate tenure holders, called jotedars, who supervised farming in the villages. Consequently, unlike the contemporaneous Enclosure movement in Britain, agriculture in Bengal remained the province of the subsistence farming of innumerable small paddy fields. The zamindari system was one of two principal revenue settlements undertaken by the Company in India. In southern India, Thomas Munro, who would later become Governor of Madras, promoted the ryotwari system, in which the government settled land-revenue directly with the peasant farmers, or ryots. 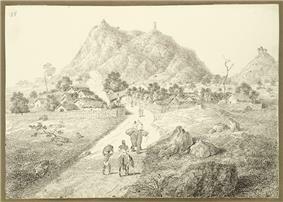 This was, in part, a consequence of the turmoil of the Anglo-Mysore Wars, which had prevented the emergence of a class of large landowners; in addition, Munro and others felt that ryotwari was closer to traditional practice in the region and ideologically more progressive, allowing the benefits of Company rule to reach the lowest levels of rural society. At the heart of the ryotwari system was a particular theory of economic rent—and based on David Ricardo's Law of Rent—promoted by utilitarian James Mill who formulated the Indian revenue policy between 1819 and 1830. "He believed that the government was the ultimate lord of the soil and should not renounce its right to 'rent', i.e. the profit left over on richer soil when wages and other working expenses had been settled." Another keystone of the new system of temporary settlements was the classification of agricultural fields according to soil type and produce, with average rent rates fixed for the period of the settlement. According to Mill, taxation of land rent would promote efficient agriculture and simultaneously prevent the emergence of a "parasitic landlord class." Mill advocated ryotwari settlements which consisted of government measurement and assessment of each plot (valid for 20 or 30 years) and subsequent taxation which was dependent on the fertility of the soil. The taxed amount was nine-tenths of the "rent" in the early 19th century and gradually fell afterwards. However, in spite of the appeal of the ryotwari system's abstract principles, class hierarchies in southern Indian villages had not entirely disappeared—for example village headmen continued to hold sway—and peasant cultivators sometimes came to experience revenue demands they could not meet. 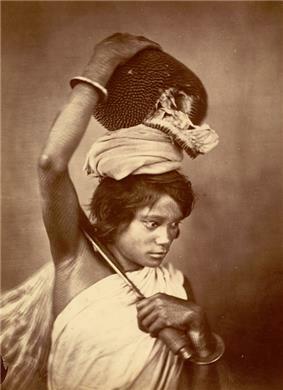 In the 1850s, a scandal erupted when it was discovered that some Indian revenue agents of the Company were using torture to meet the Company's revenue demands. Land revenue settlements constituted a major administrative activity of the various governments in India under Company rule. In all areas other than the Bengal Presidency, land settlement work involved a continually repetitive process of surveying and measuring plots, assessing their quality, and recording landed rights, and constituted a large proportion of the work of Indian Civil Service officers working for the government. After the Company lost its trading rights, it became the single most important source of government revenue, roughly half of overall revenue in the middle of the 19th century; even so, between the years 1814 and 1859, the government of India ran debts in 33 years. With expanded dominion, even during non-deficit years, there was just enough money to pay the salaries of a threadbare administration, a skeleton police force, and the army. A Royal Artillery encampment at Arcot, Madras Presidency, 1804. 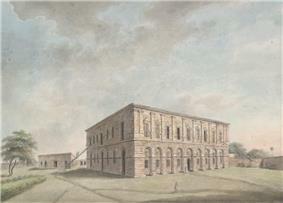 Military Orphan School for private soldiers of the East India Company, Howrah, Bengal Presidency, 1794. A new "writer" in the East India Company Civil Service arrives in Calcutta. A palanquin transport awaits him. In 1772, when Hastings became the first Governor-General one of his first undertakings was the rapid expansion of the Presidency's army. Since the available soldiers, or Sepoys, from Bengal—many of whom had fought against the British in the Battle of Plassey—were now suspect in British eyes, Hastings recruited farther west from the "major breeding ground of India's infantry in eastern Awadh and the lands around Banaras." The high caste rural Hindu Rajputs and Brahmins of this region (known as purabias (Hindi, lit. "easterners")) had been recruited by Mughal armies for two hundred years; the East India Company continued this practice for the next 75 years, with these soldiers comprising up to eighty per cent of the Bengal army. However, in order to avoid any friction within the ranks, the Company also took pains to adapt its military practices to their religious requirements. Consequently, these soldiers dined in separate facilities; in addition, overseas service, considered polluting to their caste, was not required of them, and the army soon came to recognise Hindu festivals officially. "This encouragement of high caste ritual status, however, left the government vulnerable to protest, even mutiny, whenever the sepoys detected infringement of their prerogatives." The Bengal Army was used in military campaigns in other parts of India and abroad: to provide crucial support to a weak Madras army in the Third Anglo-Mysore War in 1791, and also in Java and Ceylon. In contrast to the soldiers in the armies of Indian rulers, the Bengal sepoys not only received high pay, but also received it reliably, thanks in great measure to the Company's access to the vast land-revenue reserves of Bengal. Soon, bolstered both by the new musket technology and naval support, the Bengal army came to be widely regarded. The well-disciplined sepoys attired in red-coats and their British officers began to arouse "a kind of awe in their adversaries. In Maharashtra and in Java, the sepoys were regarded as the embodiment of demonic forces, sometimes of antique warrior heroes. Indian rulers adopted red serge jackets for their own forces and retainers as if to capture their magical qualities." 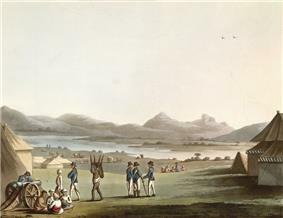 In 1796, under pressure from the Company's Board of Directors in London, the Indian troops were re-organised and reduced during the tenure of John Shore as Governor-General. However, the closing years of the 18th century saw, with Wellesley's campaigns, a new increase in the army strength. Thus in 1806, at the time of the Vellore Mutiny, the combined strength of the three presidencies' armies stood at 154,500, making them one of the largest standing armies in the world. As the East India Company expanded its territories, it added irregular "local corps," which were not as well trained as the army. In 1846, after the Second Anglo-Sikh War, a frontier brigade was raised in the Cis-Sutlej Hill States mainly for police work; in addition, in 1849, the "Punjab Irregular Force" was added on the frontier. Two years later, this force consisted of "3 light field batteries, 5 regiments of cavalry, and 5 of infantry." The following year, "a garrison company was added, ... a sixth infantry regiment (formed from the Sind Camel Corps) in 1853, and one mountain battery in 1856." Similarly, a local force was raised after the annexation of Nagpur in 1854, and the "Oudh Irregular Force" was added after Oudh was annexed in 1856. Earlier, as a result of the treaty of 1800, the Nizam of Hyderabad had begun to maintain a contingent force of 9,000 horse and 6,000-foot which was commanded by Company officers; in 1853, after a new treaty was negotiated, this force was assigned to Berar and stopped being a part of the Nizam's army. 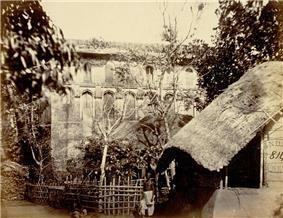 Photograph of East India Company factory in Painam, Sonargaon, Bangladesh, a major producer of the celebrated Dhaka muslins. "Mellor Mill" in Marple, Greater Manchester, England, was constructed in 1790-93 for manufacturing muslin cloth. Opium Godown (Storehouse) in Patna, Bihar (c. 1814). Patna was the centre of the Company opium industry. Indigo dye factory in Bengal. Bengal was the world's largest producer of natural indigo in the 19th century. After gaining the right to collect revenue in Bengal in 1765, the Company largely ceased importing gold and silver, which it had hitherto used to pay for goods shipped back to Britain. In addition, as under Mughal rule, land revenue collected in the Bengal Presidency helped finance the Company's wars in other parts of India. Consequently, in the period 1760–1800, Bengal's money supply was greatly diminished; furthermore, the closing of some local mints and close supervision of the rest, the fixing of exchange rates, and the standardisation of coinage, paradoxically, added to the economic downturn. During the period, 1780–1860, India changed from being an exporter of processed goods for which it received payment in bullion, to being an exporter of raw materials and a buyer of manufactured goods. More specifically, in the 1750s, mostly fine cotton and silk was exported from India to markets in Europe, Asia, and Africa; by the second quarter of the 19th century, raw materials, which chiefly consisted of raw cotton, opium, and indigo, accounted for most of India's exports. Also, from the late 18th century British cotton mill industry began to lobby the government to both tax Indian imports and allow them access to markets in India. Starting in the 1830s, British textiles began to appear in—and soon to inundate—the Indian markets, with the value of the textile imports growing from £5.2 million 1850 to £18.4 million in 1896. The American Civil War too would have a major impact on India's cotton economy: with the outbreak of the war, American cotton was no longer available to British manufacturers; consequently, demand for Indian cotton soared, and the prices soon quadrupled. This led many farmers in India to switch to cultivating cotton as a quick cash crop; however, with the end of the war in 1865, the demand plummeted again, creating another downturn in the agricultural economy. At this time, the East India Company's trade with China began to grow as well. In the early 19th century demand for Chinese tea had greatly increased in Britain; since the money supply in India was restricted and the Company was indisposed to shipping bullion from Britain, it decided upon opium, which had a large underground market in China and which was grown in many parts of India, as the most profitable form of payment. However, since the Chinese authorities had banned the importation and consumption of opium, the Company engaged them in the First Opium War, and at its conclusion, under the Treaty of Nanjing, gained access to five Chinese ports, Guangzhou, Xiamen, Fuzhou, Shanghai, and Ningbo; in addition, Hong Kong was ceded to the British Crown. Towards the end of the second quarter of the 19th century, opium export constituted 40% of India's exports. Another major, though erratic, export item was indigo dye, which was extracted from natural indigo, and which came to be grown in Bengal and northern Bihar. In late 17th and early 18th century Europe, blue clothing was favored as a fashion, and blue uniforms were common in the military; consequently, the demand for the dye was high. In 1788, the East India Company offered advances to ten British planters to grow indigo; however, since the new (landed) property rights defined in the Permanent Settlement, didn't allow them, as Europeans, to buy agricultural land, they had to in turn offer cash advances to local peasants, and sometimes coerce them, to grow the crop. The European demand for the dye, however, proved to be unstable, and both creditors and cultivators bore the risk of the market crashes in 1827 and 1847. The peasant discontent in Bengal eventually led to the Indigo rebellion in 1859-60 and to the end of indigo production there. In Bihar, however, indigo production continued well into the 20th century; the centre of indigo production there, Champaran district, became the staging ground, in 1917, for Mohandas Karamchand Gandhi's first experiment in non-violent resistance against the British Raj. The house of Sir Thomas Strange, who in 1800 became the first Chief Justice of the Fort of St. George (Madras) and wrote Elements of Hindu Law (1825). 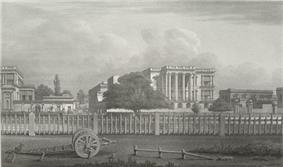 An 1833 Lithograph of the Sadr Diwāni Adālat, the Chief Civil Court for Indians, on Chowringhee Road, Calcutta. 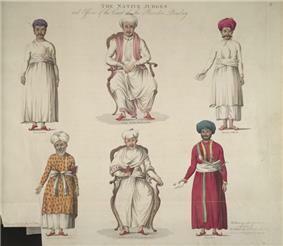 Coloured engraving of the judges and officers of Hindu (top row) and Muslim (bottom row) law in the Recorder Court in Bombay, 1805. 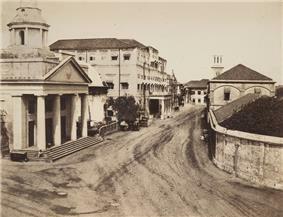 The Court-House Building on Apollo Street, Bombay (third building on left, just beyond the domed Ice House) shown in 1850. Until the British gained control of Bengal in the mid-18th century, the system of justice there was presided over by the Nawab of Bengal himself, who, as the chief law officer, Nawāb Nāzim, attended to cases qualifying for capital punishment in his headquarters, Murshidabad. His deputy, the Naib Nāzim, attended to the slightly less important cases. The ordinary lawsuits belonged to the jurisdiction of a hierarchy of court officials consisting of faujdārs, muhtasils, and kotwāls. In the rural areas, or the Mofussil, the zamindars—the rural overlords with the hereditary right to collect rent from peasant farmers—also had the power to administer justice. This they did with little routine oversight, being required to report only their judgments in capital punishment cases to the Nawāb. By the mid-18th century, the British too had completed a century and a half in India, and had a burgeoning presence in the three presidency towns of Madras, Bombay, and Calcutta. During this time the successive Royal Charters had gradually given the East India Company more power to administer justice in these towns. In the charter granted by Charles II in 1683, the Company was given the power to establish "courts of judicature" in locations of its choice, each court consisting of a lawyer and two merchants. This right was renewed in the subsequent charters granted by James II and William III in 1686 and 1698 respectively. In 1726, however, the Court of Directors of the Company felt that more customary justice was necessary for European residents in the presidency towns, and petitioned the King to establish Mayor's Courts. The petition was approved and Mayor's courts, each consisting of a Mayor and nine aldermen, and each having the jurisdiction in lawsuits between Europeans, were created in Fort William (Calcutta), Madras, and Bombay. Judgments handed down by a Mayor's Court could be disputed with an appeal to the respective Presidency government and, when the amount disputed was greater than Rs. 4,000, with a further appeal to the King-in-Council. In 1753, the Mayor's courts were renewed under a revised letters patent; in addition, Courts of Requests for lawsuits involving amounts less than Rs. 20 were introduced. Both types of courts were regulated by the Court of Directors of the East India Company. After its victory in the Battle of Buxar, the Company obtained in 1765 the Diwāni of Bengal, the right not only to collect revenue, but also to administer civil justice in Bengal. The administration of criminal justice, the Nizāmat or Faujdāri, however, remained with the Nawāb, and for criminal cases the prevailing Islamic law remained in place. However, the Company's new duties associated with the Diwāni were leased out to the Indian officials who had formerly performed them. This makeshift arrangement continued—with much accompanying disarray—until 1771, when the Court of Directors of the Company decided to obtain for the Company the jurisdiction of both criminal and civil cases. Soon afterwards civil courts of first instance, were constituted in each district; these courts were presided over by European Zilā judges employed by the Company, who were assisted in the interpretation of customary Indian law by Hindu pandits and Muslim qazis. For small claims, however, Registrars and Indian commissioners, known as Sadr Amīns and Munsifs, were appointed. These in their turn were supervised by provincial civil courts of appeal constituted for such purpose, each consisting of four British judges. All these were under the authority of the Sadr Diwāni Adālat, or the Chief Civil Court of Appeals, consisting of the Governor of the Presidency and his Council, assisted by Indian officers. Similarly for criminal cases, Mofussil nizāmat adālats, or Provincial courts of criminal judicature, were created in the interior; these again consisted of Indian court officers (pandits and qazis), who were supervised by officials of the Company. Also constituted were Courts of circuit with appellate jurisdiction in criminal cases, which were usually presided over by the judges of the civil appellate courts. All these too were under a Sadr Nizāmat Adālat or a Chief Court of Criminal Appeal. Around this time the business affairs of the East India Company began to draw increased scrutiny in the House of Commons. After receiving a report by a committee, which condemned the Mayor's Courts, the Crown issued a charter for a new judicial system in the Bengal Presidency. The British Parliament consequently enacted the Regulating Act of 1773 under which the King-in-Council created a Supreme Court in the Presidency town, i.e. Fort William. The tribunal consisted of one Chief Justice and three puisne judges; all four judges were to be chosen from barristers. The Supreme Court supplanted the Mayor's Court; however, it left the Court of Requests in place. Under the charter, the Supreme Court, moreover, had the authority to exercise all types of jurisdiction in the region of Bengal, Bihar, and Odisha, with the only caveat that in situations where the disputed amount was in excess of Rs. 4,000, their judgment could be appealed to the Privy Council. Both the Act and the charter said nothing about the relation between the judiciary (Supreme Court) and the executive branch (Governor-General); equally, they were silent on the Adālats (both Diwāni and Nizāmat) created by Warren Hastings just the year before. In the new Supreme Court, the civil and criminal cases alike were interpreted and prosecuted accorded to English law; in the Sadr Adālats, however, the judges and law-officers had no knowledge of English law, and were required only, by the Governor-General's order, "to proceed according to equity, justice, and good conscience, unless Hindu or Muhammadan law was in point, or some Regulation expressly applied." There was a good likelihood, therefore, that the Supreme Court and the Sadr Adālats would act in opposition to each other and, predictably, many disputes resulted. Hastings' premature attempt to appoint the Chief Justice, Sir Elijah Impey, an old schoolmate from Winchester, to the bench of the Sadr Diwāni Adālat, only complicated the situation further. The appointment had to be annulled in 1781 by a parliamentary intervention with the enactment of the Declaration Act. The Act exempted the Executive Branch from the jurisdiction of the Supreme Court. It recognised the independent existence of the Sadr Adālats and all subsidiary courts of the Company. Furthermore, it headed off future legal turf wars by prohibiting the Supreme Court any jurisdiction in matters of revenue (Diwāni) or Regulations of the Government enacted by the British Parliament. This state of affairs continued until 1797, when a new Act extended the jurisdiction of the Supreme Court to the province of Benares (which had since been added to the Company's dominions) and "all places for the time being included in Bengal." 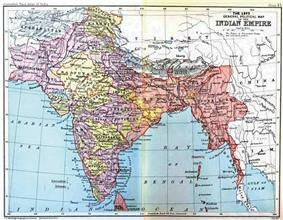 With the constituting of the Ceded and Conquered Provinces in 1805, the jurisdiction would extend as far west as Delhi. In the other two presidencies, Madras and Bombay, a similar course of legal changes unfolded; there, however, the Mayor's Courts were first strengthened to Recorder's Courts by adding a legal president to the bench. The Supreme Courts in Madras and Bombay were finally established in 1801 and 1823, respectively. Madras Presidency was also unusual in being the first to rely on village headmen and panchāyats for cases involving small claims. This judicial system in the three presidencies was to survive the Company's rule, the next major change coming only in 1861. 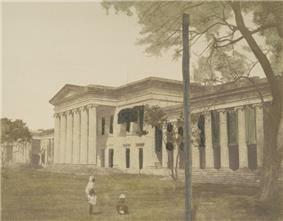 A colored-in photograph (1851) of Hindu College, Calcutta, which had been founded in 1817 by a committee headed by Raja Ram Mohun Roy. In 1855, the Government of the Bengal Presidency renamed it Presidency College and opened it to all students. 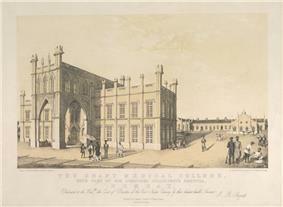 An engraving (1844) of a youth, who according to the engraver, Emily Eden, was "a favourite and successful young student at the Hindoo College in Calcutta, where scholars acquire a very perfect knowledge of English, and have a familiarity with the best English writers ..."
An 1844 engraving of Grant Medical College (left) and Sir Jamsetjee Jeejeebhoy Hospital (right background) in Bombay made by G. R. Sargeant the year before the medical college was formally opened. 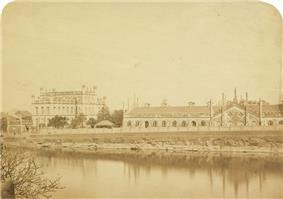 An 1855 photograph of the same two institutions. In 1857, Grant Medical College became one of three institutions affiliated with the newly established University of Bombay. 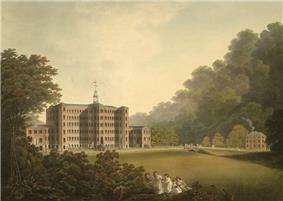 The college was funded partly by the Jeejeebhoy family and partly by the East India Company. Education of Indians had become a topic of interest among East India Company officials from the outset of the Company's rule in Bengal. In the last two decades of the 18th century and the first decade of the nineteenth, Company officials pursued a policy of conciliation towards the native culture of its new dominion, especially in relation to education policy. During the 19th century, the Indian literacy rates were rumoured to be less than half of post independence levels which were 18.33% in 1951. The policy was pursued in the aid of three goals: "to sponsor Indians in their own culture, to advance knowledge of India, and to employ that knowledge in government." The first goal was supported by some administrators, such as Warren Hastings, who envisaged the Company as the successor of a great Empire, and saw the support of vernacular learning as only befitting that role. In 1781, Hastings founded the Madrasa 'Aliya, an institution in Calcutta for the study of Arabic and Persian languages, and Islamic Law. A few decades later a related perspective appeared among the governed population, one that was expressed by the conservative Bengali reformer Radhakanta Deb as the "duty of the Rulers of Countries to preserve and Customs and the religions of their subjects." The second goal was motivated by the concerns among some Company officials about being seen as foreign rulers. They argued that the Company should try to win over its subjects by outdoing the region's previous rulers in the support of indigenous learning. Guided by this belief, the Benares Sanskrit College was founded in Varanasi in 1791 during the administration of Lord Cornwallis. The promotion of knowledge of Asia had attracted scholars as well to the Company's service. Earlier, in 1784, the Asiatick Society had been founded in Calcutta by William Jones, a puisne judge in the newly established Supreme Court of Bengal. Soon, Jones was to advance his famous thesis on the common origin of Indo-European languages. The third related goal grew out of the philosophy then current among some Company officials that they would themselves become better administrators if they were better versed in the languages and cultures of India. 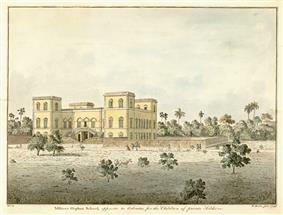 It led in 1800 to the founding of the College of Fort William, in Calcutta by Lord Wellesley, the then Governor-General. The College was later to play an important role both in the development of modern Indian languages and in the Bengal Renaissance. Advocates of these related goals were termed, "Orientalists." Many leading Company officials, such as Thomas Munro and Montstuart Elphinstone, were influenced by the Orientalist ethos and felt that the Company's government in India should be responsive to Indian expectations. The Orientalist ethos would prevail in education policy well into the 1820s, and was reflected in the founding of the Poona Sanskrit College in Pune in 1821 and the Calcutta Sanskrit College in 1824. The Orientalists were, however, soon opposed by advocates of an approach that has been termed Anglicist. The Anglicists supported instruction in the English language in order to impart to Indians what they considered modern Western knowledge. Prominent among them were evangelicals who, after 1813—when the Company's territories were opened to Christian missionaries—were interested in spreading Christian belief; they also believed in using theology to promote liberal social reform, such as the abolition of slavery. Among them was Charles Grant, the Chairman of the East India Company. Grant supported state-sponsored education in India 20 years before a similar system was set up in Britain. Among Grant's close evangelical friends were William Wilberforce, a prominent abolitionist and member of the British Parliament, and Sir John Shore, the Governor-General of India from 1793 to 1797. During this period, many Scottish Presbyterian missionaries also supported the British rulers in their efforts to spread English education and established many reputed colleges like Scottish Church College (1830), Wilson College (1832), Madras Christian College (1837), and Elphinstone College (1856). However, the Anglicists also included utilitarians, led by James Mill, who had begun to play an important role in fashioning Company policy. The utilitarians believed in the moral worth of an education that aided the good of society and promoted instruction in useful knowledge. Such useful instruction to Indians had the added consequence of making them more suitable for the Company's burgeoning bureaucracy. By the early 1830s, the Anglicists had the upper hand in devising education policy in India. Many utilitarian ideas were employed in Thomas Babbington Macaulay's Minute on Indian Education of 1835. The Minute, which later aroused great controversy, was to influence education policy in India well into the next century. Establishing a Department of Public Instruction in each presidency or province of British India. Maintaining existing Government colleges and high-schools and increasing their number when necessary. Vastly increasing vernacular schools for elementary education. Introducing a system of grants-in-aid for private schools. The Department of Public Instruction was in place by 1855. In January 1857, the University of Calcutta was established, followed by the University of Bombay in June, 1857, and the University of Madras in September 1857. The University of Bombay, for example, consisted of three affiliated institutions: the Elphinstone Institution, the Grant Medical College, and the Poona Sanskrit College. The Company's administration also founded high-schools en masse in the different provinces and presidencies, and the policy was continued during Crown rule which commenced in 1858. By 1861, 230,000 students were attending public educational institutions in the four provinces (the three Presidencies and North-Western Provinces), of whom 200,000 were in primary schools. Over 5,000 primary schools and 142 secondary schools had been established in these provinces. Earlier, during the Indian rebellion of 1857, some civilian leaders, such as Khan Bhadur Khan of Bareilly, had stressed the threat posed to the populace's religions by the new education programmes begun by the Company; however, historical statistics have shown that this was not generally the case. For example, in Etawah district in the then North-Western Provinces (present-day Uttar Pradesh), where during the period 1855–57, nearly 200 primary, middle-, and high-schools had been opened by the Company and tax levied on the population, relative calm prevailed and the schools remained open during the rebellion. In the first half of the 19th century, the British legislated reforms against what they considered were iniquitous Indian practices. In most cases, the legislation alone was unable to change Indian society sufficiently for it to absorb both the ideal and the ethic underpinning the reform. For example, upper-caste Hindu society had long looked askance at the remarriage of widows in order to protect both what it considered was family honour and family property. Even adolescent widows were expected to live a life of austerity and denial. The Hindu Widows' Remarriage Act, 1856, enacted in the waning years of Company rule, provided legal safeguards against loss of certain forms of inheritance for a remarrying Hindu widow, though not of the inheritance due her from her deceased husband. However, very few widows actually remarried. Some Indian reformers, such as Ishwar Chandra Vidyasagar, even offered money to men who would take widows as brides, but these men often deserted their new wives. 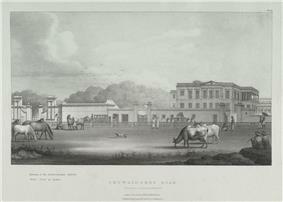 Lithograph of the General Post Office on Chowringhee Street, Calcutta, 1833, four years before the India-wide postal service was established under the Indian Postal Act of 1837. Two four anna stamps issued in 1854. Stamps were issued for the first time for all of British India in 1854. The lowest denomination was ½ anna blue, followed by 1 anna red, and 4 annas blue and red. The stamps were printed from lithographic stones at the Surveyor-General's Office in Calcutta. A semaphore "telegraph" signalling tower in Silwar (Bihar), 13 February 1823, thirty years before electric telegraphy was rapidly introduced into India by the East India Company. Before 1837, the Bombay), private individuals were, upon payment, only sparingly allowed their use. That situation changed in 1837, when, by Act XVII of that year, a public post, run by the Company's Government, was established in the Company's territory in India. Post offices were established in the principal towns and postmasters appointed. The postmasters of the Presidency towns oversaw a few provincial post offices in addition to being responsible for the main postal services between the provinces. By contrast, the District collectors (originally, collectors of land-tax) directed the District post offices, including their local postal services. Postal services required payment in cash, to be made in advance, with the amount charged usually varying with weight and distance. For example, the charge of sending a letter from Calcutta to Bombay was one rupee; however, that from Calcutta to Agra was 12 annas (or three-quarter of a rupee) for each tola (three-eighths of an ounce). After the recommendations of the commission appointed in 1850 to evaluate the Indian postal system were received, Act XVII of 1837 was superseded by the Indian Postal Act of 1854. Under its provisions, the entire postal department was headed by a Director-General, and the duties of a Postmaster-General were set apart from those of a Presidency Postmaster; the former administered the postal system of the larger provinces (such as the Bombay Presidency or the North-Western Provinces), whereas the latter attended to the less important Provinces (such as Ajmer-Merwara and the major Political Agencies such as Rajputana). Postage stamps were introduced at this time and the postal rates fixed by weight, dependent no longer also on the distance traveled in the delivery. The lowest inland letter rate was half anna for 1/4 tola, followed by one anna for 1/2 tola, and 2 annas for a tola, a great reduction from the rates of 17 years before. The Indian Post Office delivered letters, newspapers, postcards, book packets, and parcels. These deliveries grew steadily in number; by 1861 (three years after the end of Company rule), a total of 889 post offices had been opened, and almost 43 million letters and over four and a half million newspapers were being delivered annually. Before the advent of electric telegraphy, the word "telegraph" had been used for semaphore signaling. During the period 1820–30, the East India Company's Government in India seriously considered constructing signaling towers ("telegraph" towers), each a hundred feet high and separated from the next by eight miles, along the entire distance from Calcutta to Bombay. Although such towers were built in Bengal and Bihar, the India-wide semaphore network never took off. By mid-century, electric telegraphy had become viable, and hand signaling obsolete. Dr. W. B. O'Shaughnessy, a Professor of Chemistry in the Calcutta Medical College, received permission in 1851 to conduct a trial run for a telegraph service from Calcutta to Diamond Harbour along the river Hooghly. Four telegraph offices, mainly for shipping-related business, were also opened along the river that year. The telegraph receiver used in the trial was a galvanoscope of Dr. O'Shaughnessy's design and manufactured in India. When the experiment was deemed to be a success a year later, the Governor-General of India, Lord Dalhousie, sought permission from the Court of Directors of the Company for the construction of telegraph lines from "Calcutta to Agra, Agra to Bombay, Agra to Peshawar, and Bombay to Madras, extending in all over 3,050 miles and including forty-one offices." The permission was soon granted; by February 1855 all the proposed telegraph lines had been constructed and were being used to send paid messages. Dr. O'Shaughnessy's instrument was used all over India until early 1857, when it was supplanted by the Morse instrument. By 1857, the telegraph network had expanded to 4,555 miles of lines and sixty two offices, and had reached as far as the hill station of Ootacamund in the Nilgiri Hills and the port of Calicut on the southwest coast of India. During the Indian rebellion of 1857, more than seven hundred miles of telegraph lines were destroyed by the rebel forces, mainly in the North-Western Provinces. The East India Company was nevertheless able to use the remaining intact lines to warn many outposts of impending disturbances. The political value of the new technology was, thus, driven home to the Company, and, in the following year, not only were the destroyed lines rebuil, but the network was expanded further by 2,000 miles. O'Shaughnessy's experimental set-up of 1851–52 consisted of both overhead and underground lines; the latter included underwater ones that crossed two rivers, the Hooghly and the Haldi. The overhead line was constructed by welding uninsulated iron rods, 13½ feet long and 3/8 inch wide, end to end. These lines, which weighed 1,250 pounds per mile, were held aloft by fifteen-foot lengths of bamboo, planted into the ground at equal intervals—200 to the mile—and covered with a layer each of coal tar and pitch for insulation. The underwater cables had been manufactured in England and consisted of copper wire covered with gutta-percha. Furthermore, in order to protect the cables from dragging ship anchors, the cables were attached to the links of a 7⁄8-inch-thick (22 mm) chain cable. An underwater cable of length 2,070 yards was laid across the Hooghly river at Diamond Harbour, and another, 1,400 yards long, was laid across the Haldi at Kedgeree. Work on the long lines from Calcutta to Peshawar (through Agra), Agra to Bombay, and Bombay to Madras began in 1853. The conducting material chosen for these lines was now lighter, and the support stronger. The wood used for the support consisted of teak, sal, fir, ironwood, or blackwood (Terminalia elata), and was either fashioned into whole posts, or used in attachments to iron screw-piles or masonry columns. Some sections had uniformly strong support; one such was the 322-mile Bombay-Madras line, which was supported by granite obelisks sixteen feet high. Other sections had less secure support, consisting, in some cases, of sections of toddy palm, insulated with pieces of sal wood fastened to their tops. Some of the conducting wires or rods were insulated, the insulating material being either manufactured in India or England; other stretches of wire remained uninsulated. By 1856, iron tubes had begun to be employed to provide support, and would see increased use in the second half of the 19th century all over India. The first Telegraph Act for India was Parliament's Act XXXIV of 1854. When the public telegramme service was first set up in 1855, the charge was fixed at one rupee for every sixteen words (including the address) for every 400 miles of transmission. The charges were doubled for telegrammes sent between 6PM and 6AM. These rates would remain fixed until 1882. In the year 1860–61, two years after the end of Company rule, India had 11,093 miles of telegraph lines and 145 telegraph offices. That year telegrammes totaling Rs. 500,000 in value were sent by the public, the working expense of the Indian Telegraph Department was Rs. 1.4 million, and the capital expenditure until the end of the year totaled Rs. 6.5 million. 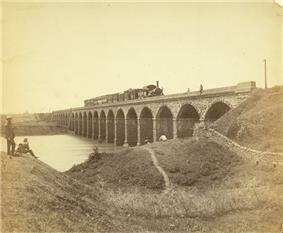 Photograph (1855) of the Dapoorie Viaduct, Bombay. The viaduct, shown with a train steaming across it, was completed in 1853 and linked Bombay Island with Thane on the mainland. 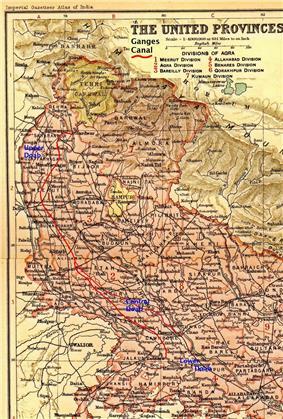 The trunk lines (shown in red on a 1908 railway map of India) proposed by the Governor-General of India, Lord Dalhousie in his Railway minute of 1853. Photograph (1855) showing the construction of the Bhor Ghat incline bridge, Bombay; the incline was conceived by George Clark, the Chief Engineer in the East India Company's Government of Bombay. The first inter-city railway service in England, the Stockton-Darlington railway, had been established in 1825; in the following decade other inter-city railways were rapidly constructed between cities in England. In 1845, the Court of Directors of the East India Company, forwarded to the Governor-General of India, Lord Dalhousie, a number of applications they had received from private contractors in England for the construction of a wide ranging railway network in India, and requested a feasibility report. They added that, in their view, the enterprise would be profitable only if large sums of money could be raised for the construction. The Court was concerned that in addition to the usual difficulties encountered in the construction of this new form of transportation, India might present some unique problems, among which they counted floods, tropical storms in coastal areas, damage by "insects and luxuriant tropical vegetation," and the difficulty of finding qualified technicians at a reasonable cost. It was suggested, therefore, that three experimental lines be constructed and their performance evaluated. Contracts were awarded in 1849 to the East Indian Railway Company to construct a 120-mile railway from Howrah-Calcutta to Raniganj; to the Great Indian Peninsular Railway Company for a service from Bombay to Kalyan, thirty miles away; and to the Madras Railway Company for a line from Madras city to Arkonam, a distance of some thirty nine miles. Although construction began first, in 1849, on the East Indian Railways line, with an outlay of £1 million, it was the first-leg of the Bombay-Kalyan line—a 21-mile stretch from Bombay to Thane—that, in 1853, was the first to be completed (see picture below). Map of the completed and planned railway lines in India in 1871, thirteen years after the end of Company rule. The feasibility of a train network in India was comprehensively discussed by Lord Dalhousie in his Railway minute of 1853. The Governor-General vigorously advocated the quick and widespread introduction of railways in India, pointing to their political, social, and economic advantages. He recommended that a network of trunk lines be first constructed connecting the inland regions of each presidency with its chief port as well as each presidency with several others. 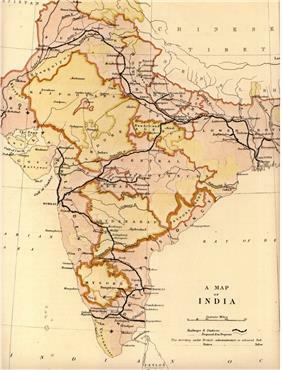 His recommended trunk lines included the following ones: (i) from Calcutta, in the Bengal Presidency, on the eastern coast to Lahore in the north-western region of the Punjab, annexed just three years before; (ii) from Agra in north-central India (in, what was still being called North-Western Provinces) to Bombay city on the western coast; (iii) from Bombay to Madras city on the southeastern coast; and (iv) from Madras to the southwestern Malabar coast (see map above). The proposal was soon accepted by the Court of Directors. During this time work had been proceeding on the experimental lines as well. 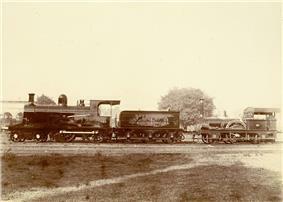 The first leg of the East Indian Railway line, a broad gauge railway, from Howrah to Pandua, was opened in 1854 (see picture of locomotive below), and the entire line up to Raniganj would become functional by the time of the Indian rebellion of 1857. The Great Indian Peninsular Railway was permitted to extend its experimental line to Poona. This extension required planning for the steep rise in the Bor Ghat valley in the Western Ghats, a section 15¾ miles long with an ascent of 1,831 feet. Construction began in 1856 and was completed in 1863, and, in the end, the line required a total of twenty five tunnels and fifteen miles of gradients (inclines) of 1 in 50 or steeper, the most extreme being the Bor Ghat Incline, a distance of 1¾ miles at a gradient of 1 in 37 (see picture above). Each of the three companies (and later five others that were given contracts in 1859) was joint stock company domiciled in England with its financial capital raised in pound sterling. Each company was guaranteed a 5 per cent return on its capital outlay and, in addition, a share of half the profits. Although the Government of India had no capital expenditure other than the provision of the underlying land free of charge, it had the onus of continuing to provide the 5 percent return in the event of net loss, and soon all anticipation of profits would fall by the wayside as the outlays would mount. The technology of railway construction was still new and there was no railway engineering expertise in India; consequently, all engineers had to be brought in from England. These engineers were unfamiliar not only with the language and culture of India, but also with the physical aspect of the land itself and its concomitant engineering requirements. Moreover, never before had such a large and complex construction project been undertaken in India, and no pool of semi-skilled labour was already organised to aid the engineers. The work, therefore, proceeded in fits and starts—many practical trials followed by a final construction that was undertaken with great caution and care—producing an outcome that was later criticised as being "built to a standard which was far in excess of the needs to the time." The Government of India's administrators, moreover, made up in their attention to the fine details of expenditure and management what they lacked in professional expertise. The resulting delays soon led to the appointment of a Committee of the House of Commons in 1857–58 to investigate the matter. However, by the time the Committee concluded that all parties needed to honour the spirit rather than the letter of the contracts, Company rule in India had ended. Although, railway construction had barely begun in the last years of this rule, its foundations had been laid, and it would proceed apace for much of the next half century. 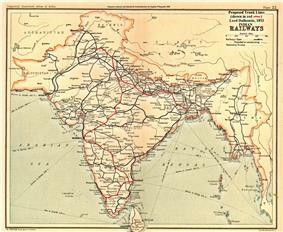 By the turn of the 20th century, India would have over 28,000 miles of railways connecting most interior regions to the ports of Karachi, Bombay, Madras, Calcutta, Chittagong, and Rangoon, and together they would constitute the fourth-largest railway network in the world. 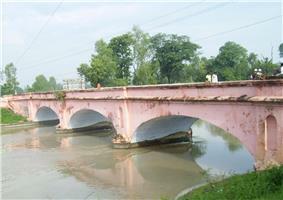 Photograph (2008) of an East India Company-era (1854) bridge on the Ganges Canal near Roorkee, Uttar Pradesh, India. 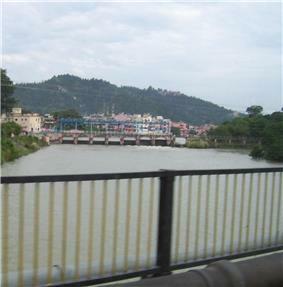 Photograph (2008) of the head works of the Ganges Canal in Haridwar, viewed from the opposite side. 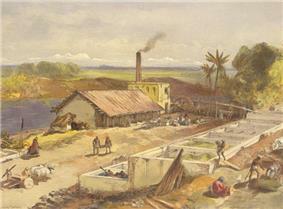 The first irrigation works undertaken during East India Company's rule were begun in 1817. Consisting chiefly of extensions or reinforcements of previous Indian works, these projects were limited to the plains north of Delhi and to the river deltas of the Madras Presidency. A small dam in the Kaveri river delta, built some 1,500 years before, and known as the Grand Anicut, was one such indigenous work in South India. In 1835–36, Sir Arthur Cotton successfully reinforced the dam, and his success prompted more irrigation projects on the river. A little farther north, on the Tungabhadra river, the 16th century Vijayanagara ruler, Krishna Deva Raya, had constructed several weirs; these too would be extended under British administration. In plains above Delhi, the mid-14th century Sultan of Delhi, Firoz Shah Tughlaq, had constructed the 150-mile long Western Jamna Canal. Taking off from the right bank of the Jamna river early in its course, the canal irrigated the Sultan's territories in the Hissar region of Eastern Punjab. By the mid-16th century, however, the fine sediment carried by the Himalayan river had gradually choked the canal. Desilted and reopened several decades later by Akbar the Great, the Western Jamna Canal was itself tapped by Akbar's grandson Shah Jahan, and some of its water was diverted to Delhi. During this time another canal was cut off the river. The 129-mile Eastern Jamna Canal or Doab Canal, which took off from the left bank of the Jamna, also high in its course, presented a qualitatively different difficulty. Since it was cut through steeply sloped land, its flow became difficult to control, and it was never to function efficiently. With the decline of Mughal power in the 18th century, both canals fell into disrepair and closed. 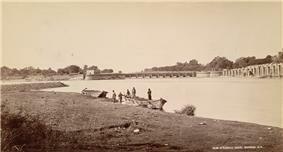 The Western Jamna Canal was repaired by British army engineers and it reopened in 1820. The Doab Canal was reopened in 1830; its considerable renovation involved raising the embankment by an average height of 9 ft. for some 40 miles. Farther west in the Punjab region, the 130-mile long Hasli Canal, had been constructed by previous rulers. Taking off from the Ravi river and supplying water to the cities of Lahore and Amritsar, this left-bank canal was extended by the British in the Bari Doab Canal works during 1850–57. The Punjab region, moreover, had much rudimentary irrigation by "inundation canals." Consisting of open cuts on the side of a river and involving no regulation, the inundation canals had been used in both the Punjab and Sindh for many centuries. The energetic administrations of the Sikh and Pathan governors of Mughal West Punjab had ensured that many such canals in Multan, Dera Ghazi Khan, and Muzaffargarh were still working efficiently at the time of the British annexation of the Punjab in 1849-1856 (Period of tenure of Marquess of Dalhousie Governor General). The first new British work—with no Indian antecedents—was the Lord Auckland, with the Court's assent, granted funds to Cautley for a full survey of the swath of land that underlay and fringed the projected course of the canal. The Court of Directors, moreover, considerably enlarged the scope of the projected canal, which, in consequence of the severity and geographical extent of the famine, they now deemed to be the entire Doab region. ^ Robb 2004, pp. 116–147 "Chapter 5: Early Modern India II: Company Raj", Metcalf & Metcalf 2006, pp. 56–91 "Chapter 3: The East India Company Raj, 1772-1850," Bose & Jalal 2003, pp. 76–87 "Chapter 7: Company Raj and Indian Society 1757 to 1857, Reinvention and Reform of Tradition." ^ Oxford English Dictionary, 2nd edition, 1989: Hindi, rāj, from Skr. rāj: to reign, rule; cognate with L. rēx, rēg-is, OIr. rī, rīg king (see RICH). ^ "in Council," i.e. in concert with the advice of the Council. ^ Colin Newbury, "Patronage and Professionalism: Manning a Transitional Empire, 1760–1870." Journal of Imperial and Commonwealth History (2013) 42#2 pp: 193-213. ^ Philip Lawson (2014). The East India Company: A History. Routledge. pp. 149–54. ^ Rahman, Siddique Mahmudur. "Postal Services During The East India Company's Rule In Bengal." Bangladesh Historical Studies 19 (2002): 43. Bose, Sumit (1993), Peasant Labour and Colonial Capital: Rural Bengal since 1770 (New Cambridge History of India), Cambridge and London: Cambridge University Press. .
Chandavarkar, Rajnarayan (1998), Imperial Power and Popular Politics: Class, Resistance and the State in India, 1850–1950, (Cambridge Studies in Indian History & Society). Cambridge and London: . Gilmour, David. The Ruling Caste: Imperial Lives in the Victorian Raj (New York: Farrar, Straus and Giroux, 2005). Guha, R. (1995), A Rule of Property for Bengal: An Essay on the Idea of the Permanent Settlement, Durham, NC: Duke University Press, . Stokes, Eric; Bayly (ed. ), C.A. (1986), The Peasant Armed: The Indian Revolt of 1857, Oxford: Clarendon Press, p. 280, . Tomlinson, B. R. (1993), The Economy of Modern India, 1860–1970 (The New Cambridge History of India, III.3), Cambridge and London: Cambridge University Press. .
Majumdar, R. C.; Raychaudhuri, H. C.; Datta, Kalikinkar (1950), An Advanced History of India, London: Macmillan and Company Limited. 2nd edition. Pp. xiii, 1122, 7 maps, 5 coloured maps.